British Foreign Secretary Boris Johnson says he's proud of his country's role in helping create the State of Israel. British Foreign Secretary Boris Johnson on Sunday defended his predecessor's role a century ago in paving the way for the creation of Israel, saying two sovereign states for Israelis and Palestinians remains the "only viable solution" for peace, AFP reported. Johnson's comments come ahead of the 100th anniversary of the Balfour Declaration which will be marked this Thursday. The November 2, 1917, Balfour Declaration was sent by then-British Foreign Secretary Arthur Balfour and proclaimed Britain’s support for the establishment of a Jewish national home in then-Palestine. Prime Minister Binyamin Netanyahu will travel to London to mark the anniversary. The Palestinian Arabs, however, remain angry over the declaration and have for months been waging a campaign aimed at forcing Britain to apologize for the document. 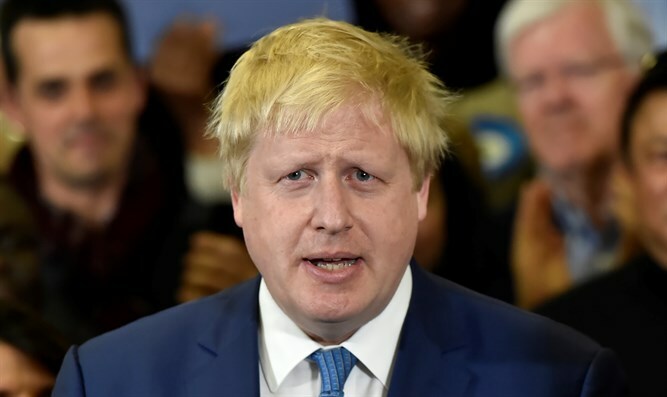 "I am proud of Britain's part in creating Israel," Johnson wrote in the Telegraph newspaper on Sunday, adding the document was "indispensable to the creation of a great nation". But he warned that one of the key caveats of the Balfour Declaration – that the rights of non-Jewish communities shall be protected -- "has not been fully realized." At the same time, he also stressed that London remained committed to a two-state solution.